CAAMA, in association with Canadian Music Week, is facilitating access for Canadian artists and labels to the United Kingdom (England, Scotland, Wales) and Ireland. With a population of 64.1 million, the UK is the third largest in the European Union (behind Germany and France.) It is the second largest music market in Europe and ranked fourth worldwide with industry revenues of US$1.33 billion (*IFPI RIN 2014) and the largest performance rights market in the world. 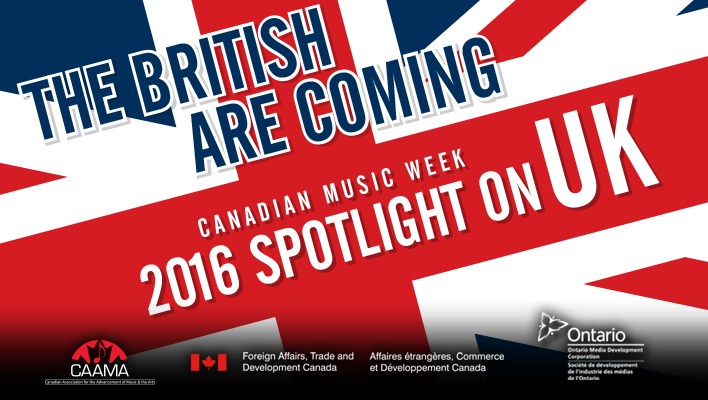 In May 2016, at Canadian Music Week in Toronto, will be hosting labels, booking agents, festival organizers, promoters, talent buyers and industry specialists from the entertainment sectors in order to open new trade routes for Canadians who are interested in furthering opportunities with these two key European markets as part of a Spotlight on the UK and Focus on Ireland. CAAMA will provide a market intelligence report and trade support for Canadian artists and music companies to do business. The report will include an in-depth overview of the territories and we anticipate the report will serve as an invaluable resource in future preparations for the 2016 Spotlight and Focus activities. Vick Bain is the CEO of the British Academy of Songwriters, Composers & Authors (BASCA), the professional association for the UK's music creators and the home of the prestigious Ivor Novello Awards. Vick graduated top of her class with a BA in music & theatre from Sheffield University in... read moreVick Bain is the CEO of the British Academy of Songwriters, Composers & Authors (BASCA), the professional association for the UK's music creators and the home of the prestigious Ivor Novello Awards. Vick graduated top of her class with a BA in music & theatre from Sheffield University in 1996 and with a varied career in the creative industries in the intervening years; in 2012 she graduated from Henley Business School, Reading University, with her MBA (dissertation focus Employers Attitudes Towards Equality & Diversity in the UK Music Industry). Vick sits on the UK Music board, the UK Music Research Group, the UK Music Rights Committee, the British Copyright Council, the PRS Creator Voice program, the joint Accreditation Committee of JAMES (Joint Audio Media Education Support), the steering group for Henley College of Management’s MBA for the Creative Industries and previously Chaired the UK Music Skills & Education Committee. Vick has led a number of campaigns within BASCA, launching the Day The Music Died campaign in early 2015 in order to improve the safety, transparency and remuneration for songwriters and composers online. BASCA is also at the forefront of campaigning for the protection of the BBC, greater diversity in the music industry, improving EU copyright legislation, fair compensation for private copying and writer credits on online streaming services. Jo Dipple is Chief Executive of UK Music and one of the most senior women working in the music industry today. Her first task as incoming Chief Executive was to push the Live Music Bill through Parliament. In her previous role as UK Music’s senior political advisor, Jo had been a key part... read moreJo Dipple is Chief Executive of UK Music and one of the most senior women working in the music industry today. Her first task as incoming Chief Executive was to push the Live Music Bill through Parliament. In her previous role as UK Music’s senior political advisor, Jo had been a key part of the team that negotiated the Bill through its legislative stages. The Live Music Act came into effect on October 1st 2012, a day she renamed “Rocktober”. She outlined an ambitious programme for UK Music concentrating on industry representation, research, skills and training. With collaboration from all of UK Music’s members, she launched a report called Measuring Music. 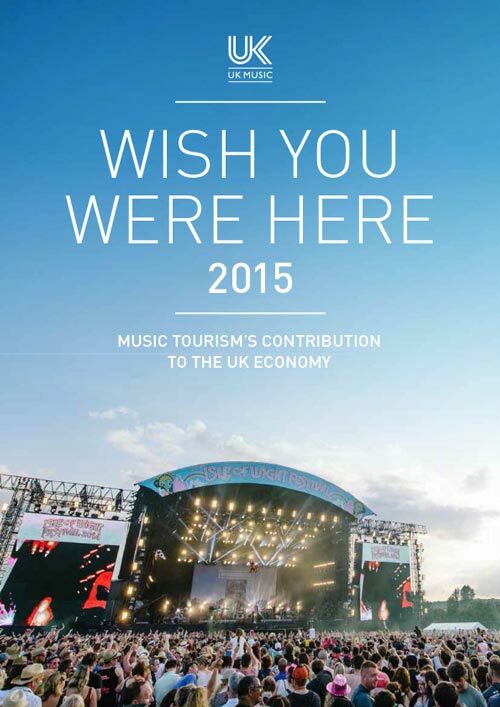 This annual project shows the economic worth of the British music industry in terms of GVA (economic contribution less costs), employment and exports. Over time, and until SIC and SOC code failures are resolved, Measuring Music is a powerful tool to reach out to Parliament and for industry to identify market trends. Jo has put UK Music at the forefront of the agenda on copyright and online infringement. UK Music’s representations ensure the British music industry presents a unified voice to politicians and business leaders. She made education and training a key plank of the organisation’s work. An alliance with Creative & Cultural Skills saw UK Music launch the music industry’s only Skills Academy with the CBI. Since July 2013, the Academy facilitated 50 music apprentices, launched a Music Academic Partnership and published a Code of Practice for internships. Under this progressive skills and training programme, UK Music developed an app-based game called Music Inc. Designed by Aardman Animations, UK Music took the game into secondary schools across the UK and taught hundreds of thousands of 16-24 year olds about the business of music. Game players face challenges of illegal downloading and copyright infringement, running out of money, making money, managing bands, song-writing, licensing and other real life music business experiences. Jo helped re-launch the influential All-Party Parliamentary Group on Music, whose secretariat is now run by UK Music. This has meant establishing the agenda for meetings and events and ensuring they attract high calibre business leaders and decision makers. Having started out as a singer/songwriter and coming from a mostly live and events background, Debra Downes set up Dawson Breed Music in 2007 at the closure of independent UK pop agency Concorde International Artistes after 6 years as the manager and setting up the developing talent roster.... read moreHaving started out as a singer/songwriter and coming from a mostly live and events background, Debra Downes set up Dawson Breed Music in 2007 at the closure of independent UK pop agency Concorde International Artistes after 6 years as the manager and setting up the developing talent roster. Responsible for overseeing the operational delivery, the commercial performance and content development of the Genting Arena and Barclaycard Arena in Birmingham in the United Kingdom, Guy has 20 years of operational and commercial experience in venue management. The Genting Arena (formerly the LG... read moreResponsible for overseeing the operational delivery, the commercial performance and content development of the Genting Arena and Barclaycard Arena in Birmingham in the United Kingdom, Guy has 20 years of operational and commercial experience in venue management. The Genting Arena (formerly the LG Arena) is a 15,600 capacity multi entertainment venue on the site of the National Exhibition Centre, Birmingham. The Genting Arena is regularly in the top 10 venues in the world in the Pollstar attendance standings, attracting major concerts, sports and entertainment events such as Take That, Maroon 5, Fleetwood Mac, Neil Diamond, Paul Simon and Sting in 2015 and is home to Horse of the Year Show and Crufts. The Barclaycard Arena (formerly the National Indoor Arena) is a 15,900 capacity arena in the centre of Birmingham, and has hosted World Championships Sports events such as the World Indoor Athletics Championships, World Badminton Championships and the World BMX Championships. It also attracts major concerts, comedy and entertainment events. In 2015, the Barclaycard Arena hosted the likes of One Direction, Paul McCartney, Madonna, Bette Midler, Queen and Adam Lambert, Slipknot, Fall Out Boy, Lionel Richie and Disney on Ice. Guy has successfully led the delivery of major events such as BBC Sports Personality of the Year, the Ryder Cup Gala Dinner and Horse of the Year Show. He was a key member of the Client Advisory Team for the £29million redevelopment of the Genting Arena and £26 million redevelopment of the Barclaycard Arena, from involvement in creating the initial architect brief through to the successful completion of both projects. He was the Chairman of the National Arenas Association (the NAA) in the UK from 2013 - 2015, which is the industry association representing indoor venues in the UK over 5,000 capacity. He is now a member of the Steering Group for the association and before becoming Chair, led the NAA training and development programme for the previous 3 years and instigated the launch of the NAA Safety Advisory Group. He was a founder board member of the International Association of Venue Management Europe and lectured in Customer Service and Booking and Scheduling in the Arena business at the European Academy of Venue Management for 4 years. Stuart Galbraith is CEO of Kilimanjaro Live, one of the most successful and respected live music promotion companies in the UK. Galbraith has been a key player in the growth of UK live music over the last four decades. 2015 will Kilimanjaro’s most successful year to day. The summer will be a... read moreStuart Galbraith is CEO of Kilimanjaro Live, one of the most successful and respected live music promotion companies in the UK. Galbraith has been a key player in the growth of UK live music over the last four decades. 2015 will Kilimanjaro’s most successful year to day. The summer will be a highlight in the Kili story, with three Ed Sheeran nights sold out at Wembley Stadium – making Ed the first person in history to headline the 80,000 capacity venue single-handed. This mighty feat is a testament to the skill, dedication and strategic excellence of Galbraith and his team. Chris Goss is co-founder/owner of Hospital Records, the leading brand in drum & bass. Established in 1996 with business partner Tony Colman, the pair made music as London Elektricity, til Chris withdrew from recording work in 2002 to focus on building the company. Hospital pioneered... read moreChris Goss is co-founder/owner of Hospital Records, the leading brand in drum & bass. Established in 1996 with business partner Tony Colman, the pair made music as London Elektricity, til Chris withdrew from recording work in 2002 to focus on building the company. Hospital pioneered artist development within the genre, discovering artists such as High Contrast, Danny Byrd, and Netsky, and in 2001 launched the clubnight “Hospitality”, which has grown into the award-winning brand it is today. Keith Harris began work in the record industry in 1974. The first record company for which he worked was a small independent UK label called Transatlantic records. The label represented mainly British folk musicians but also distributed the Blue Note and Milestone Jazz labels. In 1976 he joined... read moreKeith Harris began work in the record industry in 1974. The first record company for which he worked was a small independent UK label called Transatlantic records. The label represented mainly British folk musicians but also distributed the Blue Note and Milestone Jazz labels. In 1976 he joined EMI Records where he initially worked for several in-house EMI labels in the promotions department. These labels included Rocket where he worked on the Elton John album ‘Blue Moves’, Fantasy, Ariola and EMI International. He then joined Motown which was an EMI licensed label. He worked for Motown for two years ending up as General Manager for the label. During his period at the label he worked with artists such as Marvin Gaye, Diana Ross, Smokey Robinson, The Commodores, Rick James, The Supremes, Thelma Houston and Stevie Wonder. He left Motown in 1978 and moved to Los Angeles to work with Stevie Wonder and became Operations Manager for Stevie’s companies. On his return to the UK in 1982 he formed his own management company and has been involved in the management of various UK based artists since. He has managed Junior Giscombe, Junior Tucker, Paul Johnson, & Omar. Keith also managed the late Lynden David Hall. He is a Consultant on Performer Affairs for PPL - www.ppluk.com. He is a former Chairman of the MMF the managers trade body -www.ukmmf.net. He is the Chairman of Musictank - www.musictank.co.uk. He is a Trustee of the EMI Music Foundation, The Midi Music Company and The British Music Experience. Andy Malt became editor of CMU in 2009, having joined the company in 2007. Leading the title ever since, he has overseen the expansion of both the CMU Daily and the CMU website, as well as the launch of CMU Premium and the CMU Podcast. As part of the CMU team, he is also an advisor on the... read moreAndy Malt became editor of CMU in 2009, having joined the company in 2007. Leading the title ever since, he has overseen the expansion of both the CMU Daily and the CMU website, as well as the launch of CMU Premium and the CMU Podcast. As part of the CMU team, he is also an advisor on the programming of CMU Insights @ The Great Escape. Prior to joining CMU, Andy spent a decade in various guises in the music industry. He kicked off what was to become his career with a fanzine, Indigo Flow, while still at school, moving the operation online while mainstream internet use was still in its infancy. He then spent years unsuccessfully trying to think of a better name for it before celebrating its tenth anniversary by shutting it down. After leaving university, he launched an independent record label, Human Recordings, and enjoyed a brief stint as a roadie. McGinnis is a broadly experienced music publisher with a specialist background in synchronisation marketing and licensing. Following a decade learning the legal and technical foundations of music rights management and licensing at PPL and MCPS, McGinnis joined Mute Song in 1999 as Licensing Manager. Over time McGinnis' role with the publisher developed and expanded until he was appointed Head of the division in 2014. As Head of Mute Song David McGinnis manages all of the division's A&R, creative and business affairs activity, supervises the copyright, royalty and sync teams and directs the company's future development and growth. Mute Song publishes many internationally renowned recording artists and a very successful roster of composers working in film, television, opera, theatre and ballet. The Mute Song roster includes Nick Cave & The Bad Seeds, Max Richter, Johann Johannsson, Underworld, Bob Geldof & The Boomtown Rats, Swans, Josh T Pearson, Public Service Broadcasting, Liars, Gavin Friday, Cabaret Voltaire, Fad Gadget, The Hidden Cameras, Venetian Snares and many other important artists. David McGinnis is a regular public speaker and panelist at events such as South By Southwest (Austin), In The City (Manchester), Go North (Inverness), The Great Escape (Brighton), BUMA Music In Motion (Amsterdam), Music Finland (Tampere), The Sync Summit (Paris) and Tune In (Tel Aviv). McGinnis has also addressed events for The Music Publishers Association (MPA), The Association of Independent Music (AIM), The National Film and Television School (UK), Platform One College Of Music (Isle Of Wight) and The Academy Of Contemporary Music (Guilford). Mark is the founder & CEO of Music Glue, a London (UK) based Direct-to-Fan (D2F) platform that empowers artists of all sizes to become global retailers by commercialising the direct relationship with their fans. Music Glue consolidates the best of Shopify, Kickstarter & Eventbrite and is... read moreMark is the founder & CEO of Music Glue, a London (UK) based Direct-to-Fan (D2F) platform that empowers artists of all sizes to become global retailers by commercialising the direct relationship with their fans. Music Glue consolidates the best of Shopify, Kickstarter & Eventbrite and is the only platform available today allowing artists anywhere in the world to sell any product (digital content, physical items, experiences or tickets) to anyone, anywhere, in any currency, any language and via any device. The head of the International Live Music Conference (ILMC), Greg has spent two decades involved in the international live music industry. The former editor of IQ Magazine, Greg became MD of ILMC two years ago after eight years as the Director of Content & Media. In 2015, he launched the... read moreThe head of the International Live Music Conference (ILMC), Greg has spent two decades involved in the international live music industry. The former editor of IQ Magazine, Greg became MD of ILMC two years ago after eight years as the Director of Content & Media. In 2015, he launched the International Festival Forum, which sold out six weeks in advance. Geoff Taylor is Chief Executive of the BPI, the representative body for UK record labels, and of BRIT Awards Ltd, which stages the annual BRIT Awards show. He is also a Director of the Official Charts Company, a Governor of both the BRIT School for the Performing Arts & Technology in Croydon... read moreGeoff Taylor is Chief Executive of the BPI, the representative body for UK record labels, and of BRIT Awards Ltd, which stages the annual BRIT Awards show. He is also a Director of the Official Charts Company, a Governor of both the BRIT School for the Performing Arts & Technology in Croydon and of East London Arts & Music – the Industry Academy (ELAM), and a Trustee of the UK music business' charity, The BRIT Trust. Neil Warnock is Head of Worldwide Music at premier global talent and literary agency United Talent Agency and former president and founder of The Agency Group, one of the world’s foremost entertainment booking agencies. Under his guidance, The Agency Group operated five international offices with... read moreNeil Warnock is Head of Worldwide Music at premier global talent and literary agency United Talent Agency and former president and founder of The Agency Group, one of the world’s foremost entertainment booking agencies. Under his guidance, The Agency Group operated five international offices with nearly 100 agents, a staff of over 220, and a combined roster of more than 2000 celebrated musicians, speakers and authors. In 2015, United Talent Agency acquired The Agency Group, combining it with UTA’s existing music practice to form UTA Music. Neil Warnock and UTA Music believe in their artists above anything else. Their focus is seizing opportunities so clients thrive—developing long-term careers and focusing on maximizing their full potential as opposed to short term hits. “Lack of investment in long-term careers combined with short-term thinking has been an area of definite concern for the music industry going forward,” according to Warnock. UTA Music are not a faceless accounting set-up with a veneer of music/promotion in the shop window. Whilst the others compete for ever smaller margins in one-off events, Neil does what he always does, thinks long-term. He is ceaseless in his quest in building a classic British brand, brick by brick, based on core values and quality. What is good for the artist’s career benefits everybody involved in the long-run is his mantra, and it’s served him brilliantly in what has been one of the UK’s most outstanding music industry careers. Warnock’s career spans over five decades during which he has represented of consulted on many of history’s most influential musicians including the Rolling Stones, Pink Floyd, Johnny Cash, Simon & Garfunkel, Dolly Parton, and Michael Jackson. As well as newer artists such as Nickelback, Katie Melua and Caro Emerald. There have been many notable coups, not least of which being the confirmation of a headlining slot for Dolly Parton at the world famous Glastonbury festival in 2014. Warnock doesn’t get side-tracked by celebrity; he is all about the music and securing Dolly such a prestigious placing at a festival noted for its cool factor epitomizes his focus on quality. At the age of 15 Londoner Warnock left school to become an apprentice printer and instead launched his career as an agent. In his spare time, he worked with many of London’s semi-professional bands booking their shows at colleges and universities in the area. Over-time he quickly became a force within the college booking circuit. Soon thereafter, he opened his own booking agency, South Bank Artists, which came to manage a majority of bookings for all of the major colleges and universities in and around London, with artists such as Pink Floyd, Tyrannosaurus Rex, Soft Machine and Jethro Tull. Within two years of opening South Bank Artists, Warnock was recruited by NEMS Enterprises, the legendary home of The Beatles, where he became the Directory of Contemporary Artists at age 25. In 1973 he joined The Bron Agency as Managing Director. In 1981 he bought out the company and changed its name to The Agency Group. As CEO of The Agency Group, Warnock implemented an unconventional boutique like strategy where agents represent specific acts for the whole of their career, rather than having specific agents represent each act in definite territories. Warnock continues international trailblazing in the industry and has had significant success in booking tours in established and emerging markets, including Asia, South America, and Eastern Europe. Among his many unparalleled achievements are Michael Jackson’s tour in India, the Rolling Stones’ tours in South East Asia and two European tours, and Pink Floyd’s tour in Russia while the iron curtain was still in place. As part of his career, Warnock has been lucky enough to be acknowledged on several occasions for his contribution to the industry. Among his accolades he has been awarded the Classic Rock VIP Award in 2005, Booking Agent of the Year at the Pollstar Awards in 2007, 2008, 2011 and 2012, Agent of the Year at the A&R Worldwide Industry Awards in 2014, and more recently receiving Agent of the Year 2015 at the MUSEXPO Awards and the coveted Strat at the Music Week Awards 2015. The company’s talent pool includes the full spectrum in artist development, including emerging artists, artists at the pinnacle of their careers, and legends in music.